INSPIRED BY 17TH AND 18TH CENTURY STILL LIFES OF FRUITS AND GRAPES, "VINEYARD" REFLECTS THE OLD WORLD BEAUTY LESLEY SO ADMIRES. Achieved through her "reverse glass art" technique, the result of a two-year quest to learn how to replicate the crackle and patina of the Old Masters, the result is a work of luminous perfection. Mixing her own paints using historically correct pigments, she then adds her signature crackle finish to the artwork and finally, hand-applies layers of golden bronze leaf. Lesley imports the same pigments once used in ancient Egyptian tombs to create "Vineyard's" creamy colored background. The unique crackle process invokes old world drama and miraculously transforms the art. A rare golden bronze leaf, made exclusively for Lesley by Italian craftsmen, adds untold depth and dimension to the luscious grape clusters and "vintage" wine labels. 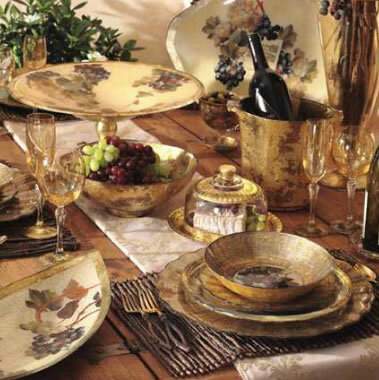 The classic patterns feature six different grape colorations, an assortment of chateau inspired wine labels, on a wide variety of glass shapes, making this extensive collection a food connoisseur's dream come true.